I have to admit, my experiences with the great Vietnamese export noodle known as Pho have not reached levels of obsession as some of my fellow food bloggers. I just really don’t understand what all the hype is with the noodle. The Boy points out it’s because I don’t eat beef. And therefore, forfeit all the natural tendencies to crave the delightfully rich warm clear broth of the beef noodles. I have to agree with that. All I ever order in a Vietnamese restaurant is usually a combination of spring rolls (fried or rice paper), lemongrass pork chop with broken rice or a chicken Pho noodle. So nothing very exciting. Because of what I order, I much prefer the Malaysian noodle soup of Kuey Teow Teng, which to me is more flavourful and delicious. To each its own I say. However, as the weather is abnormal in Melbourne, we have been having bouts of wintery weather. Windy, cold, rain lashing. That kind of weather. And it was after such a week of dreadful weather, with me craving a hot bowl of warm delicious noodle soup, that when the sun decided to pop its head out to bloom over us with its goodness, the Boy decided to take me to Footscray for a visit. 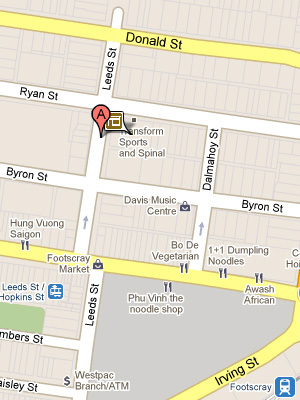 The heartland of Vietnames cuisine as some would say. Not knowing the area very well, I decided to take to Twitter for noodle recommendations and ended up at Pho Tam upon Half-Eaten’s suggestion. Stomach juices roiling with excitement, we went on to order a plate of spring rolls and a bowl of noodle each! 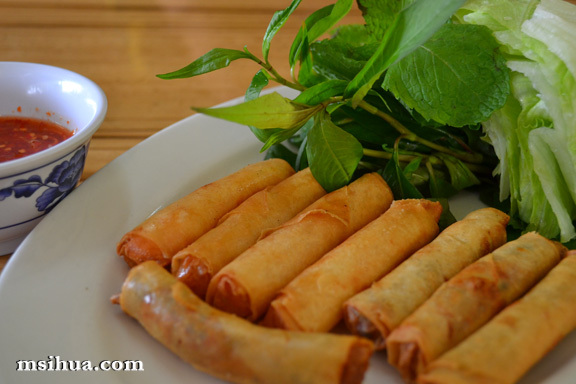 Our Cha Gio Tom & Thit (Mixed Spring Rolls of 4 Pork and 4 Prawn Spring Rolls) $9.50 arrived and with great anticipation upon looking at the gloriously golden brown skin, took one, wrapped it in a lettuce leaf, dipped it in sauce, chomped down on the delicate and crisp spring roll. The Boy, unlike myself, has no qualms about eating beef, and happily ordered the Pho Tai (Traditional Beef Soup Noodles with freshly sliced Beef) $9.00. The soup smelt so good, that even I had a hard time concentrating on my spring roll. He said it was delicious. The broth was rich in beefy goodness. Well seasoned with medium rare slices of beef. I looked on jealously as he began slurping on his noodles. 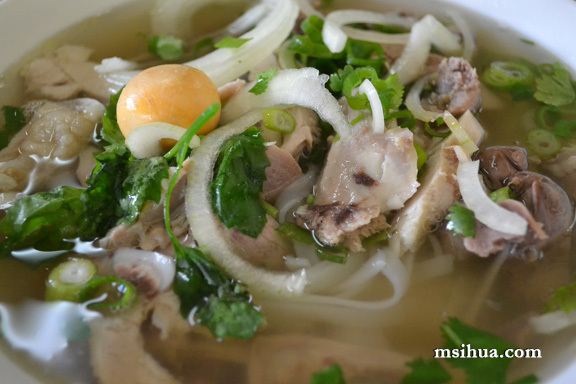 Until my Pho Ga Dac Biet (Traditional Chicken Soup Noodles with chicken slices and chicken organs) $9.00 arrived on the table. I don’t usually get a chance to order a whole bowl of chicken and organs, and when this bowl was placed in front of me, I was torn between a slight apprehension of over eating some organs I’ve never tried before, to a sudden quickening of my pulse that I’d be eating such a delicious array of organs. Call me a carnivore. What I don’t do in cow and veal, I more than make up in other meats and offal. But I do draw the line somewhere. I’m not sure if I would be able to eat dogs, elephant or monkeys. I will eat a whole chicken or pig because you shouldn’t waste food. But I find it hard to convince myself to eat the more, say exotic animals, because they weren’t really meant for eating IMHO. Tasting the chicken soup first, I was surprised at how light the MSG was in this. Instead, the stock was rich in flavour from the chicken, and not overladen with saltiness. Delicious! I happily ate the giblets, tried the liver (yuck) and heart (yum!). I also saved the little hard boiled egg yolk for last. I love chicken heart, chicken testicle, chicken liver… yum yum!! give me offals, i’ll clean the plate up! 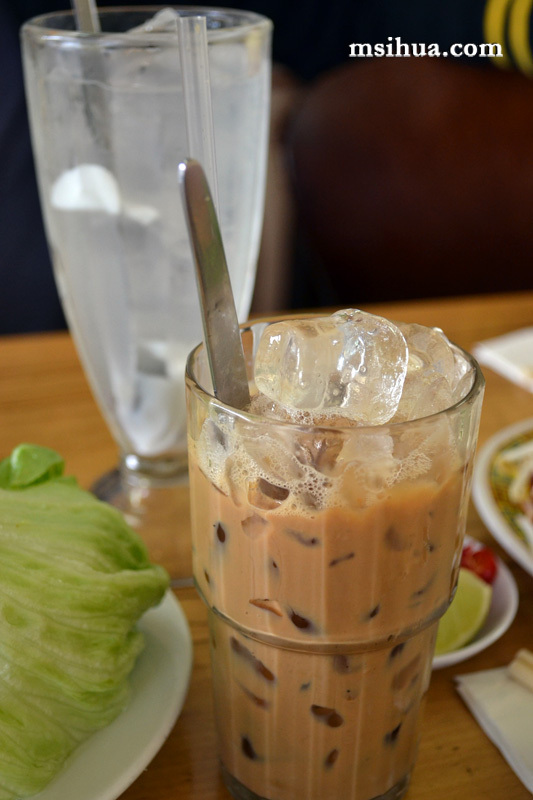 I’m actually a bit odd in that I don’t generally go for meat, but I do love liver and pate and want to try tripe again after a bad experience years ago 🙂 Mostly, though, I really want your Iced Coffee!! Man that coffee was yummo! I’m very much like you, I prefer the other items to Pho. It doesn’t mean that I don’t like Pho but I like other soups or the pork chop with broken rice or the salads. But Mr NQN is a pho addict! I think your Boy is right about the reason why you’re not hugely into pho! 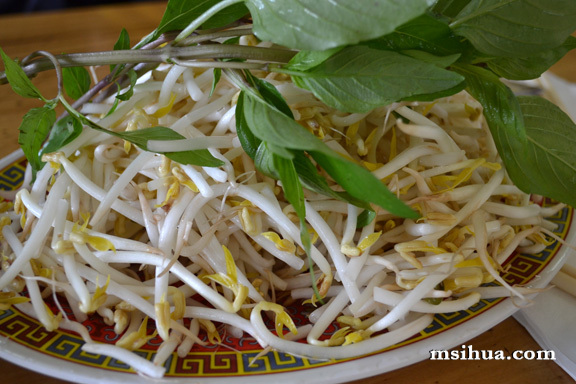 So glad you liked Pho Tam! There’s been some strange goings on and fluctuations in quality around Footscray lately. 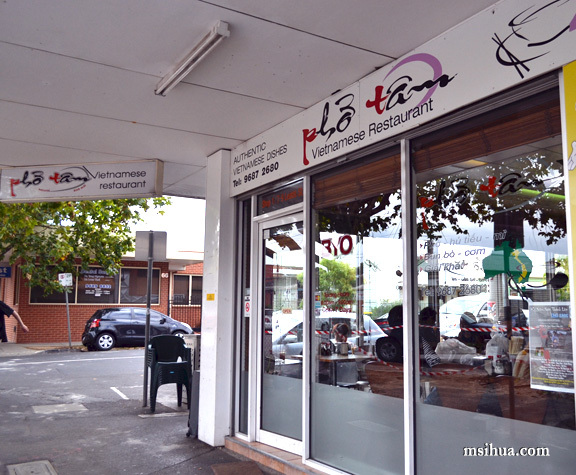 Which only means, of course, I’m going to have to do another exhaustive survey of the neighbourhood’s pho. There are a few I haven’t tried yet, anyway. I’m also a big fan of the chicken offal, and like you, I love the hearts. It’s a bit tautologous, huh? The livers are an acquired taste, however. 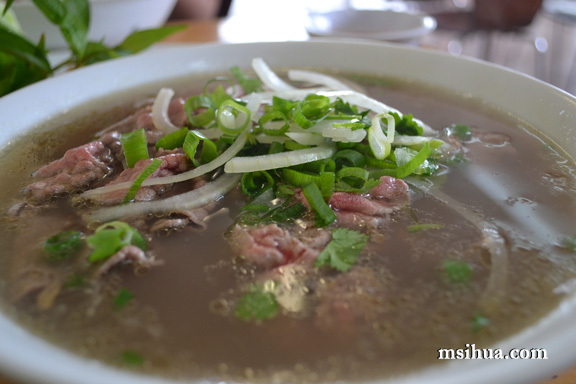 And yes, the Boy is right – beef pho is a whole different world to chicken pho. Though chicken pho is usually my go-to when I’m sick. I guess chicken noodle soup transcends cultural boundaries, hey?